Located in the downtown area, close to bars, restaurants, souvenir markets, 10 minutes from de beach and 15 minutes from the Airport and center conventions. If you want to save some money during your staying in Cancun, this hotel offers cheap accommodation, clean rooms, affordable breakfast or dinner and a friendly service. The rooms are decorated in soft, fresh colors, rest in this spacious room and get ready to enjoy everything Cancun downtown has to offer. Very close you will find our Palapa Bar where beer and spirits are served while you enjoy the privileged caribbean weather with your favorite cocktail. 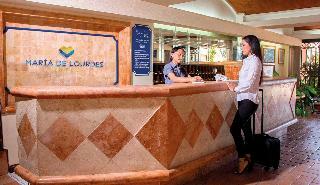 María de Lourdes is the best Cancun lodging choice for your trip to Mexico. With numerous amenities for guests such as 24 hour front desk, cable/satellite tv, restaurant, you will wake up at María de Lourdes feeling refreshed every day for your time in Cancun. Don’t let this amazing reservation opportunity pass you by, book your stay at María de Lourdes today to make the most of your time in Cancun, Mexico.